Prison Officer roles are wide ranging and varied and the type of work you can expect to be involved in will depend on the Prison Officer role you undertake. Patrol: observing and monitoring the security and behaviour of people in custody, identifying and responding to breaches of security and order. Reception: managing the entry and discharge of offenders from prison, assessing the needs of individual offenders and ensuring the correct procedures are followed. Electronic Control Room (ECR): responsibility for the movement and security of staff and prisoners throughout the prison establishment. 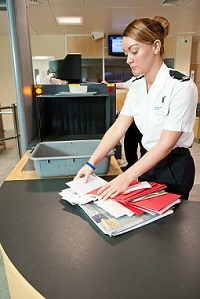 Front of House: ensuring a high level of security and customer service as the first point of contact for staff and visitors entering the prison establishment. Visits: responsibility for the security and order of prisoner visit sessions through effective observation and searching. During your first two years as an Operations Officer, you will work towards and achieve an SVQ Level 3 in Custodial Care. This is a nationally recognised award offered by the Scottish Qualifications Authority in partnership with the Scottish Prison Service. The SVQ in Custodial Care is a work-based qualification which assesses the skills and knowledge which people have and need to perform their job role effectively. On successful completion of the qualification, you may wish to consider promotion within the SPS to Residential Officer, Officer Instructor/Vocational Training Instructor, or First Line Manager. Promotion opportunities are subject to organisational requirements and are conducted through competitive internal selection processes. If you are interested in developing your Prison Officer career further, you may consider opportunities for promotion to Residential Officer. 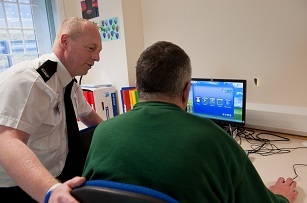 Residential Officers work within the residential areas of the prison establishment, actively engaging in partnership working both within the SPS and with external agencies. As a Residential Officer, you will use your well-developed interpersonal skills to foster effective relationships with those in our care and support them to become more responsible citizens. You will undertake the role of Personal Officer, ensuring positive engagement with offenders and contributing towards offender case management, ensuring compliance with relevant policies and processes. Officer Instructors and Vocational Training Officers are Prison Officers who work with and develop the knowledge and skills of offenders in particular crafts or disciplines, including for example; painting and decorating, joinery, catering, plumbing, bicycle maintenance, hairdressing and IT skills. As well as learning particular skills and on some occasions gaining qualifications, the training provides opportunities for those in our care to develop life skills such as effective communication, positive team working and a sense of responsibility. With an ever-changing prisoner population, our aim is to ensure that our workforce reflects Scotland’s diversity, delivering activities and services which have the capacity and capability to help transform the lives of those in our care to make them more responsible citizens and in turn making Scotland a safer place to live. Our Prison Officers are central to achieving this. If you share our Values and you would like a career which allows you to make a positive impact on the lives of Scotland’s citizens, visit our Current Vacancies page to view our current vacancies and to register for job alerts.